Quick review: A nice, little, self-contained novel. 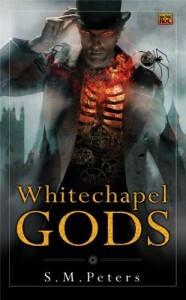 I haven't read much in the urban fantasy/steampunk genres but Peters' Whitechapel reminds me of Mieville's New Crobuzon in its atmosphere and in its half-human/half-machine inhabitants. Peters' work isn't as mind-twisting as Mieville's but it's reasonably inventive and fresh, and the characters are not simple, one-dimensional caricatures. In fact, the most evil and dangerous character is the human John Scared, not the putative enemies Grandfather Clock and Mama Engine. I gather from trolling this site that Peters has published a second novel set in the same world - Ghost Ocean (though, like Jeffrey Barlough's Western Lights books, you don't need to read the current novel as prelude), which I would be interested in reading. As to this one: Recommended to steampunk aficionados, and people who just like a well told, standalone tale.